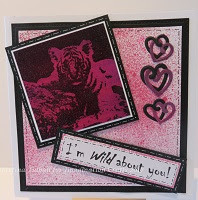 Exciting New Product Launch on Hochanda Tomorrow!! Hello! 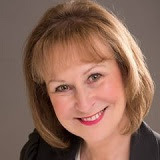 Sue from Imagination here with our latest news. What an incredibly busy few weeks it's been. We got back from Glasgow a couple of days ago - we had a lovely time at the SEC, thank you to everyone who visited the stand - and now we're preparing for Kerri-Ann's shows on Hochanda tomorrow, our trip to the NEC in Birmingham next week for the Hobbycrafts show AND our next One Day Special on Hochanda. Add all of that to all the new products we're going to be launching this year and there isn't time for our feet to touch the ground! 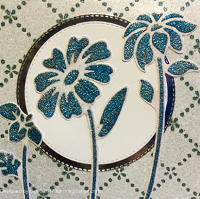 For right now, I am very excited to tell you about our Brand New TV Product Launch tomorrow, Saturday 11 March at 8am, 1pm and 5pm GMT on Hochanda TV. 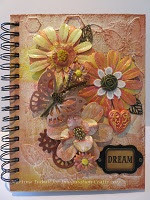 Kerri-Ann will be showing you the very latest trend in Planner/Journals but with an exciting twist! What else would you expect from Imagination Crafts?!! Not only can you decorate the fabulous canvas covers, but we are also launching some brand new stamp sets that work perfectly with the planner/journals. We have words, numbers, phrases, banners, months, fabulous little icons and much more. Of course, the show wouldn't be complete without some of our new Art Stencils, which we know you are absolutely loving. We are also bringing you some beautiful, brand new, Art Stamps. They are really so sweet, we don't think they will last very long so please don't miss out on these. We have a brand new product on the show called Shake and Gilt. WOW! is all I can say to this and it works on FABRIC too!! What a plus that is! I have never seen such intense shimmer and shine. I will admit to you that initially I wasn't sure about planners/journals, but after working with them I am absolutely hooked - I love them because I can truly express myself and my creativity and keep a record of it. I am doing one for my garden and I keep nipping back to turn the pages and take another look. I feel so inspired and sometimes when you are feeling like you've lost your 'mojo', these books of inspiration are just the boost we need. 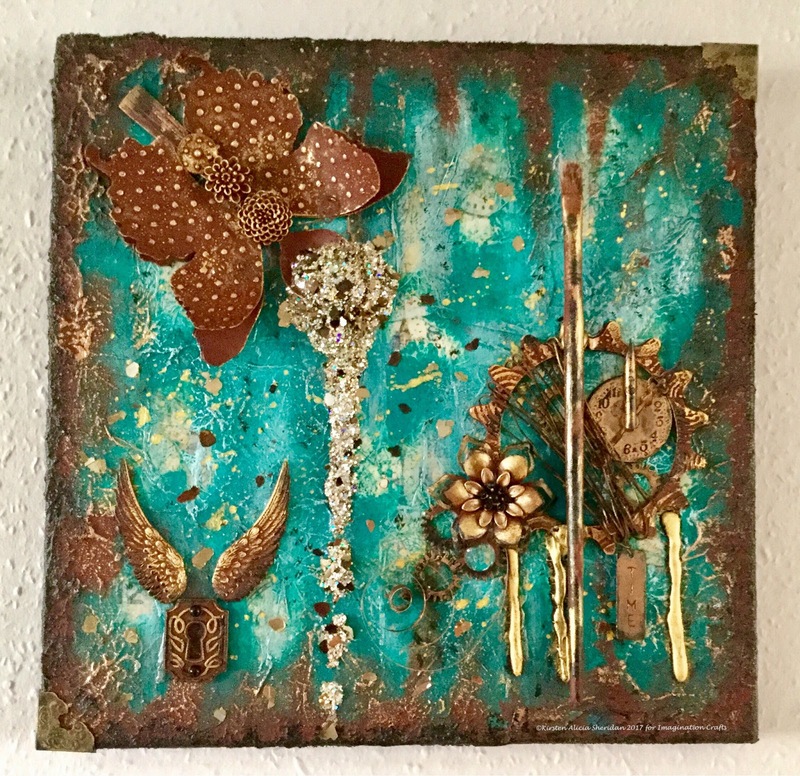 Lisa and Martina have made the gorgeous samples you see in this newsletter. Alongside Jennifer & Kerri-Ann they have worked so hard to get as many made as they could for tomorrow's programmes, (what else would you expect from such a talented team??!!). They all inspire me so much. Kerri-Ann's first programme tomorrow is at 8am GMT with the lovely Yannis. She will be back at 1pm and 5pm GMT. 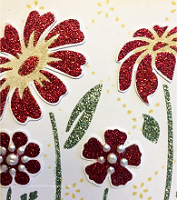 She will do as many demos as she can fit in and remember, if you have questions you can email the Hochanda studio, or visit our Facebook page, where Kirsten will be commenting on the programmes and posting product information, etc. That's all from me for now. I hope you can tune in to tomorrow's programmes. And if you're visiting the Hobbycrafts show at the NEC, please visit the Imagination Crafts stand - A12 - where you'll find Lisa B and I demoing lots of our new products, we would love to see you. Have a great weekend and keep crafting! 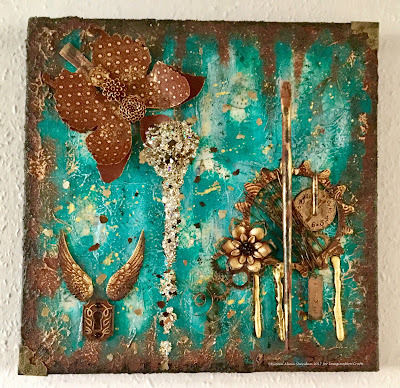 The canvas is a Tim Holtz pre-printed one called District Market. It had been in my stash for a while so I decided it was time I used it. The first thing I did was to cover it with tissue paper that I first crumpled & uncrumpled, so that it was already creased. This was the first layer of texture. The second layer of texture was Imagination's FANTASTIC new Structure Paste around the edges, scraping the excess over the rest of canvas. (I left this to dry overnight, the Sparkle Medium & Decoupage Glue mix was very wet, but the texture held extremely well). Alchemy Wax & I loved that I was able to do that. Rusty Patina is 100% opaque, so it will cover whatever's underneath it completely. Starlight Wax is semi-opaque & I wanted the very edges of the canvas to be dark, so I just made sure each layer of wax was completely dry before I added another. (It was my first time using Starlight Wax & I'm happy to say it's as easy to use as any of Imagination's other products). Thank you for visiting the Imagination Crafts' blog today, we hope to be back soon.